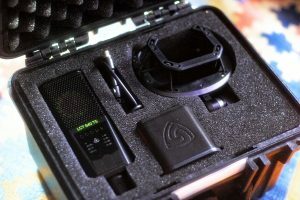 However a few companies have come up whose philosophy is to use modern technology to break new ground into what can be done with microphone performance. A few months ago I reviewed Lewitt‘s LCT 940, a hybrid Valve (Tube)/ Fet condenser mic with the ability to dial in any combination between the two circuits. It has quickly become my main mic for recording vocals. I also regularly use a pair of LCT 550s, an eerily quiet (self noise at a theoretical zero) cardioid condenser with a superior transient response and a sound that balances focussed yet smooth highs with a huge bottom end. The microphone I have here right now is the new LCT 640 TS, an offspring of Lewittt’s best selling multi pattern LCT 640 but with a some very special capabilities. 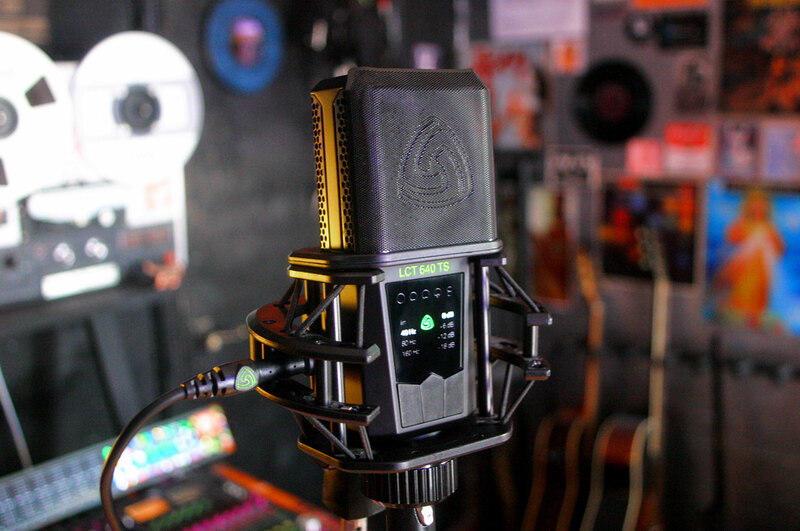 The LCT 640 TS is a dual capsule microphone but not in the conventional sense: the signal from each capsule can be recorded separately and combined offline (courtesy of a bespoke plugin called the Polarizer) to change the polar pattern response after the recording has been made. Yep. The LCT 640 TS can also use the separate capsule circuits to easily make MS stereo recordings that do not need complicated decoding processes. So once again, we have something quite special from Lewitt on our hands. This is a great solution since the popper stopper is one of those items that are a nightmare to carry around as they tend to break or tear very easily. My only worry was that, being so close to the grille, it might not be effective enough in preventing plosives, but after having used it for a few days it has proved itself to work perfectly well. It even stays on if you like to mount the mic upside down. Lewitt, please make a larger one for the 940! At a first glance the LCT 640 TS looks pretty much the same as it’s siblings from the Lewitt stable, except from the gargantuan sized LCT 940. It’s large enough not to deflate vocalists’ egos but also light enough not to make mic stands droop when placed in akward positions or when mounted on an amp clamp such as the Wishbone Hook v.2 I’ve mostly been using with it for recording electric guitar (see photo). The construction is reassuringly tough with a dense zinc body and a very solid grille. In terms of specs the LCT 640 TS shows 11 dB(A) measured in cardioid, not quite close to the theoretical 0 of the LCT 550 but absolutely fine for any real-world scenario. Max SPL is a good 132 dB, and that’s without using the pre-attenuation options. The familiar buttons and illuminated leds select and highlight the high pass filters, set at 40, 80 and 160 Hz, the five multiple polar patterns (omni, wide cardioid, cardioid, super cardioid, and figure of 8) and the trademark Lewitt Key Lock and Clipping History functions. Testing it as a “normal” microphone the LCT 640 TS has the family Lewitt sound that I got to know and love: clear, detailed, true to the source and yet somewhat flattering and most importantly devoid of harshness or sibilance. Compared to the Lewitt condensers I have here the LCT 640 TS is slightly warmer than my LCT 550s, a mic whose main strength is the almost inexistent self noise and amazing transient response – and somewhat similar to the 940 in FET mode, which is to say very detailed but with a certain heft – obviously with some differences due to the smaller size of the basket. It doesn’t sound quite as big on vocals as the LCT 940 with some of the valve dialled in but it’s very much in the same ballpark. The LCT 940 has quickly become my to go microphone for vocals and most solo instruments so that is a very encouraging start. Just like with the 940, the polar patterns sound solid and well defined. In order to operate the LCT 640 TS in DOM the mini XLR adaptor has to be plugged in and phantom power applied to both capsules. Needless to say that you will need a stereo preamp. The capsules will take about twenty seconds to charge. 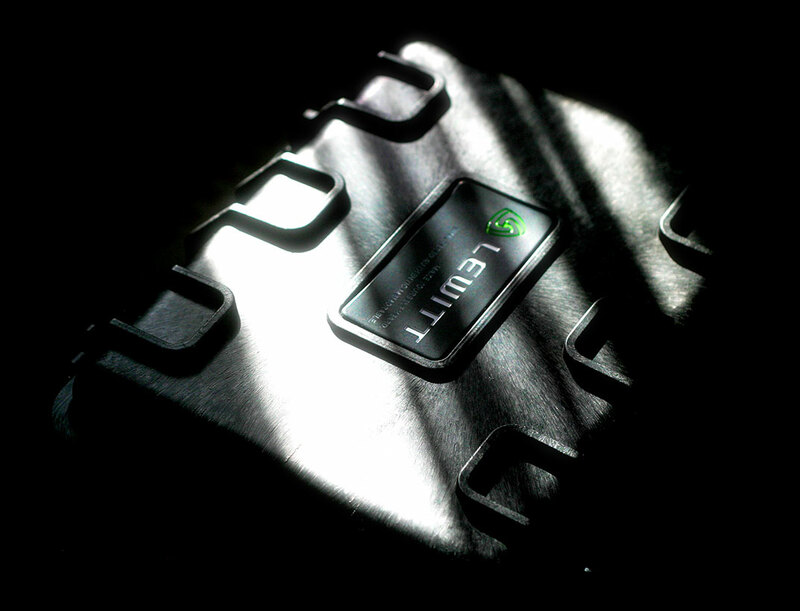 Then the centre button has to be pressed for two seconds – the green triangular logo illuminates to show that the mic is in DOM, and the polar pattern indicators are, of course, disabled. You have to make sure that the gain on both channel is matched, which is easier to do accurately with digitally controlled preamps such as the ones on my Metric Halo ULN-8, but in practice I have found it to be no problem when working with all analogue preamps. Just like the polar patterns in “normal” mode DOM is remembered after phantom power has been switched off so the operation must not be repeated each time the mic is powered on. The mini XLR does not click in but it’s fit is more than solid enough to avoid having to worry about it coming off. The tiny Lewitt logo on it acts as a visual indicator (it has to face forward) so that connecting it in a dimly lit environment is not a problem. When the mic is on the shock mount the adaptor will be placed between one of it’s two plastic elements. Its very important to remember to remove the adaptor before taking the microphone out of the shock mount, otherwise there is a serious risk of straining the Mini XLR connector. Nico Sabatini is an in demand session guitarist, with work ranging from top West End musicals to writing, arranging and performing for several jazz and rock ensembles. For testing the LCT 640 TS he chose from his collection a gorgeous handmade Patrick Eggle Etowa 000 acoustic. The LCT 640 TS was well up to the task – you can feel the wood and the zing of the strings in every take. When auditioning the recordings, Nico said that that is the sound he hears in his head when recording acoustic guitar – quite a compliment to a microphone. We recorded a jazz improvisation in cardioid, omni and figure of 8, plus a file where I automated the Polarizer plugin to sweep through the patterns. The preamp used on Nico’s recordings is an Audient asp 880. Last but not least, this is a second take recorded in glorious stereo, simply tilting the microphone on it’s side. Recording in MS stereo is clearly not a sideline feature of the LCT 640 TS, listen for yourself! Omni (0:0), Cardioid (0:8), Figure of 8 (0:14), Rear Cardioid (0:20), Omni (0:24). Later in the week, I worked on a track with the brilliant Elvin Brandhi, and we set some time aside to record a snippet for this review. I really like how the figure of 8 brings out the chest details in her voice, but the other two patterns sounds great too, full, detailed, natural and present. 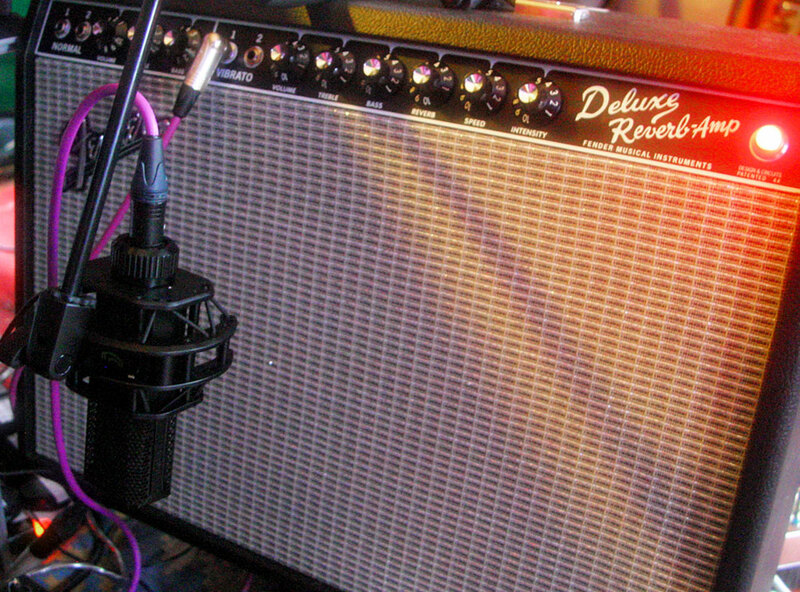 For these takes I used a Drawmer 1960 with a touch of compression – a couple of dbs on peaks. Here are some samples of my Jazzmaster. I’m normally weary of recording electrics with a condenser for fear of harshness or a rendition that is too clinical, and prefer a dynamic mic such as the Shure SM7B, Lewitt MTP 440 DM or Heil PR30. Listen to how the guitar and amp were captured in a big, warm organic manner. I also uploaded a take of just the compressed back capsule, an interesting roomy sound that could work well in a spacey mix. The chain for this take was Jazzmaster > Celmo Sardine Can compressor > Eventide TimeFactor > Fender Deluxe Reverb. Then I tried recording a sub octave fuzz sound courtesy of the Catalinbread Perseus, whose name is borrowed from the above mentioned Perseus Constellation, where a husky voiced black hole emits the lowest sound recorded, so far, in the Universe: 57 octaves below B-flat. This is a super quirky, super cool and very unpredictable analogue pedal whose tracking can be rather idiosyncratic. It’s not an easy sound to grab, my dynamic mics tend to feature just the bigness without the rasp, my ribbons even more so. For this take I took the LCT 640 TS off the amp clamp and placed it on a stand about a metre away from the amp. The chain was: Vox Snake Charmer compressor > Catalinbread Perseus > Catalinbread Dirty Little Secret MkIII > Xotic Effects EP Booster > Eventide TimeFactor > Fender Deluxe Reverb. The last two samples are some percussion recorded in stereo. The LCT 640 TS did great, my playing leaves a lot to be desired. Both were done with the Drawmer 1960 and a touch of compression. The LCT 640 TS will be particularly appreciated by those who see writing and recording as part of one organic creative process. There are so many things I haven’t tried yet that I’m looking forward to do with this microphone. Automating the pattern response can be used during a mix as a more natural alternative to eq. Keep a part on omni, or even use the back capsule to make it sink into the mix and turn it to figure of 8 to bring it to the fore in the chorus… Very interesting and exciting stuff. For someone like me, who often works for productions where sounds that come off the beaten path are highly desirable – such as scoring for contemporary dance companies – what can be done with this mic is invaluable: applying different effects to the two capsules whilst tracking, experimenting with compression on the ambiance whilst keeping the main signal close and focussed, working creatively on the stereo image…. Then there are the stereo capabilities: MS recording can be a real chore to do in the conventional way, which is why it was never part of my recording routines – until now. And flipping the mic on it’s side to do a stereo take is definitely more endearing during a busy session than having to rig in a second mic. It would also make the perfect “travel” mic for those who need to travel light – a microphone to bring on location with which you can do just about anything. And of course it’s also a great tool for larger studios and engineers who want to keep their options open until the mix phase. The LCT 640 TS is not only a box of tricks though. It is also, and perhaps in the first place, a very, very good sounding microphone that you can throw at just about anything trusting that you will get a great result. The LCT 640 TS will have an expected street price of €899. I think that is more than fair for a microphone that sounds so good and can do so much.